Bulgarian Orthodox Christians celebrate Palm Sunday - Tsventisa-Vrabnitsa, to mark the triumphal arrival of Christ into Jerusalem. The Bulgarian tradition is to carry flowers and willow branches, rather than palm leaves, and the day is also regarded as the holiday of the fields, meadows and forests. It is one of the most important holy days, falling one week before Easter, and marking the beginning of the Passion of Christ. This year, Easter falls on the same date for both Orthodox and Western believers. In Bulgaria, the entire weekend is an occasion of festivity. Saturday marked Lazarovden (Lazar's Day), when Christ raised the faithful Lazarus from the dead. 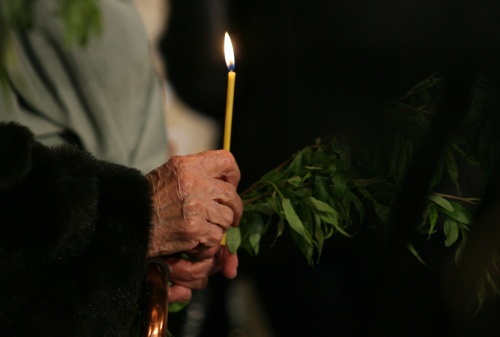 Lazarovden ceremonies, called Lazarouvane, are among the best-loved Bulgarian traditions. The Saturday before Easter is a festival devoted to young girls, pastures, fields and woods. In Bulgaria's village communities, Lazarovden was quite an event in the life of every young girl, for then she could demonstrate to the townspeople that she had already grown to be a "complete maiden". The girls would gather in groups of about ten at the house of the prettiest one and start from there with their songs to make a round of the village. The songs sung on St Lazar's Day praise the beauty of the maiden and her lover, the industry of the farmer, the purity of maternal love and express wishes for happiness and prosperity. Lazarovden is the name day for all Bulgarians of that name, or its derivatives, while Tsvetnitsa is devoted to all who have names associated with flowers and plants. In Sofia's Alexander Nevsky Cathedral, the Bulgarian Patriarch Maxim is leading the solemn mass. The parliamentary Speaker, Tsetska Tsacheva, and ex-PM Simeon Saxe-Coburg are among the large congregation.